Air pollution has plagued Southern California for as long as people have been writing about the region. The haze wasn't photochemical smog, of course; the internal combustion engine and modern industrial factories were still centuries away. Rather, it was smoke emanating from the dozens of Tongva Indian villages that dotted the coastal plain and inland valleys, rising in wispy columns only to flatten out against an invisible ceiling. That invisible ceiling was formed by a persistent meteorological phenomenon that continues to threaten Angelenos' lungs: temperature inversion. A product of the Southland's topography and its prevailing weather patterns, the inversion layer forms when ocean breezes draw cool marine air onshore beneath a mass of warmer air above. 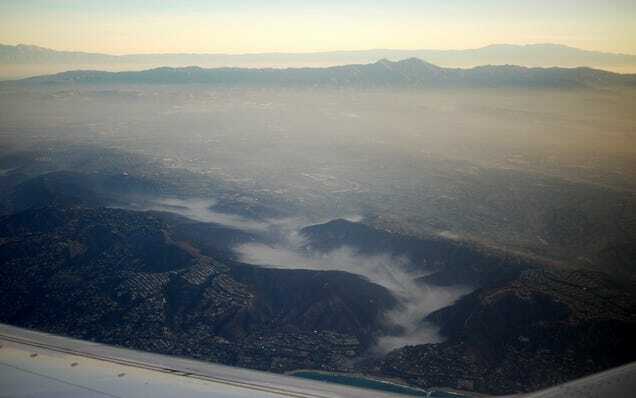 Held in place by the mountains that shelter Los Angeles on the north and east, the cool air then stabilizes, unable to rise through the warm air above. Short of building giant fans to blow the stagnant air over the mountains and into the desert, there's little the Southland can do to disrupt its natural inversion layer. But the region can control the pollutants it pours into the atmosphere. In recent decades, Southern California has made huge strides toward keeping its air clean. Between 1976 and 1980, for example, the South Coast Air Basin recorded an average of 112 stage 1 ozone alerts per year. It hasn't experienced one since 2003. Describing what LA currently has as "Smog" really doesn't give people now an idea of what LA smog was like when I was growing up in the 60s. It was like Beijing is now. You have to go way inland to get anything even remotely resembling 60s smog. What you get now is slightly tinted water vaper. 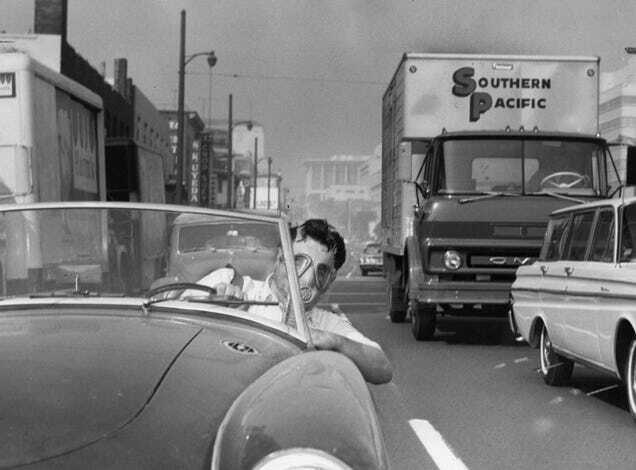 We had "smog alerts" when I was a kid, where breathing LA air felt like breathing mustard gas. It burned your eyes, it burned your nose, and it especially burned your lungs. Cleaning up LA's air did come at a cost though. It de-industrialized the area. All of the major employers in South Central LA and the industrial areas to the east pulled up stakes and moved, deepening entrenched poverty in the area. There are plenty of states who don't give a crap about the health of their population, as long as the politicians get bribed through campaign financing. And if they can't find a state that will let them poison their own people, they'll find a whole country that will.